Colin Kaepernick Nike Ad: "Believe in something. Even if it means sacrificing everything." After releasing a new advertisement campaign with Colin Kaepernick as the face of the campaign, Nike faced serious backlash on social media and in the stock market. However, since that initial crash, Nike’s stock has significantly increased and is now at an all-time high. The first ad released was a black and white image of Kaepernick with the bold message, “Belief in something. 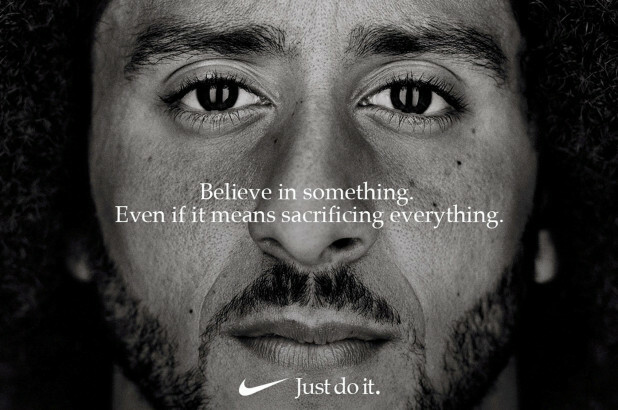 Even if it means sacrificing everything,” and, of course, it came with Nike’s signature line: “Just do it.” The quote was not anything particularly unique for Nike, however, the image of Kaepernick prompted major controversy. To understand why it is important to first know who Colin Kaepernick really is. Originally just a San Francisco 49er’s quarterback, Kaepernick has become one of the most influential civil rights activists in recent years, simply by taking a knee. Back in August 2016, the pre-season for the 49ers, Kaepernick, a 28-year-old man of color, sat while his teammates stood during the pre-game singing of the national anthem. He continued to do so for two weeks, going unnoticed by the media. Then, on September 1, 2016, Kaepernick took a new approach and decided to kneel during the anthem. In doing so, he was able to make a stronger impression on his audience while being more respectful to the Americans who serve this country. Kaepernick’s sentiment was shared by other teammates and players all throughout the NFL. Soon handfuls of players from almost every team kneeled, linked arms, or made some display of protest. It was not just African American players who participated in the protests–many of their white teammates joined in solidarity. As the protest spread throughout the NFL, people outside of football began to join the movement. Suddenly, prominent figures in other sports such as basketball started kneeling, and it was not just limited to sports–people were kneeling at any cantation of the anthem, whether it be at performances or in schools. But as the movement has gained traction and increased in popularity, so have its opponents. Some Americans view the anthem as a symbol of respect and commemoration for the fallen military and police officers who have served America, so they viewed kneeling during the anthem as un-American, disrespectful, and wrong. As a result, the NFL’s ratings plummeted, Kaepernick was unable to sign with a team, and a massive counter-movement began. Opposition to the national anthem protests escalated, fueled by President Trump condemning the protests in a rally speech and labeling Kaepernick as a “son of a b—-.” Despite this, Kaepernick has come out and said that he in no way intends to disrespect our flag or those who serve our country, but that kneeling is purely a protest against racial injustices that plague people of color in America. Though he is no longer an NFL quarterback, Kaepernick has become a champion of civil rights. In the face of extreme opposition, he exercised his first amendment rights and sacrificed everything to stand up (or rather kneel) for what he believed in. That’s why Nike chose him to lead their campaign. As a multi-billion dollar company, Nike knew this choice would cause backlash… and it did. Videos began surfacing online of people burning their Nike shoes and apparel. Hordes of people took to Twitter to say that they would be switching to “stripes,” which refers to one of Nike’s biggest competing brands, Adidas. Directly following the release of the ad and a subsequent video featuring Kaepernick as the narrator with the tagline “Don’t ask if your dreams are crazy. Ask if they’re crazy enough,” Nike experienced a whopping $3.3 billion drop in market value. However, their ad soon proved itself to be extremely effective, as Nike fully recovered from their stock market drop and far-surpassed its original value. It has surged 33% this year, closing at a stock value of $83.49 as of early this week. Additionally, Nike has sold out 61% more merchandise, and online sales of Nike apparel increased more than 31% since the release of the ad.